In a preschool writing center, children are provided with many tools to encourage the development of many skills. 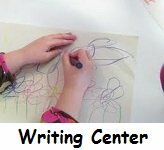 The importance of a writing center in preschool (or having writing materials available every day) and its impact on preschool growth and development should not be underestimated! The activities provided in such an area are not necessarily those that result in the printing word! They can, and SHOULD, help develop pre-writing skills and more. Recognize and identify letters of the alphabet in print, environment and/or own name. Demonstrate increased emergent writing skills such as random marks, controlled scribbles, basic shapes, letter-like marks or letters to represent words, stories, ideas, experiences or objects. Practice left to right progression in reading. Providing writing materials and tools as well as the time to explore those tools are the key to children developing the skills listed above. Traditional tools and materials are great! So are some non-traditional materials! 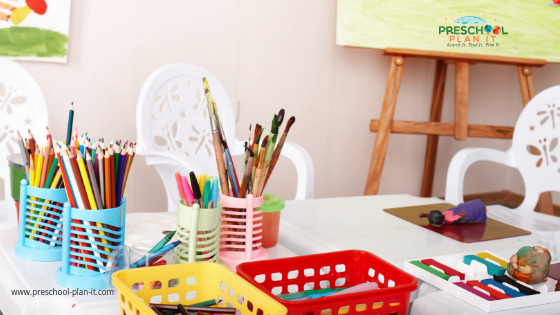 When choosing materials for your writing center in preschool, step outside the box and consider items beyond pens, pencils and markers! Here are some of my favorite tools and materials! These are less traditional materials but those that encourage children to use writing center tools in fun ways. Choose the materials to be used at your preschool writing center based on the preschool writing activities and concepts you are working on with your children or the Theme you are working on (Dinosaurs, etc.). For example, with a dinosaur theme, add dinosaur stamps, stencils, pictures, etc. For themed ideas for your writing center, CLICK HERE to go to the Themes Page of this website! Choose your theme and then scroll down to the preschool Writing Activities section within that theme! Find some preschool writing activities here!